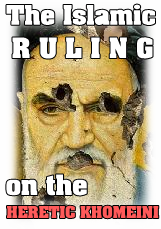 NEWEST SUPER RAFIDITE SAFAVID KHORAFAH (superstition) – CARDBOARD KHOMEINI! The Muslim Ummah has been faced with many unusual and absurd event in the past three decades of the rule of the Rafidite Safavid Shi’ite clergy. 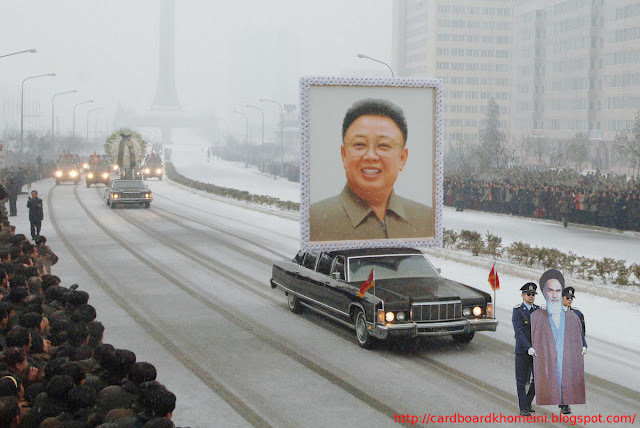 The February 1 ceremony, however, may have topped them all. 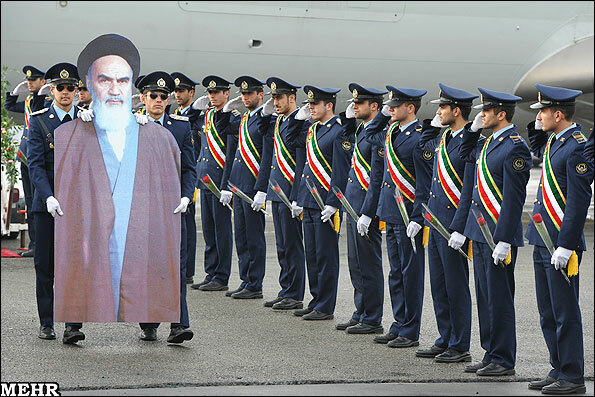 The revolutionary fervor is long gone amid widespread disillusionment, hence the heretics came up with a series of pictures posted by the semi-OFFICIAL Mehr news agens shows two solemn looking guards carrying a cardboard Khomeini as others give him salute. No this isn’t a joke. 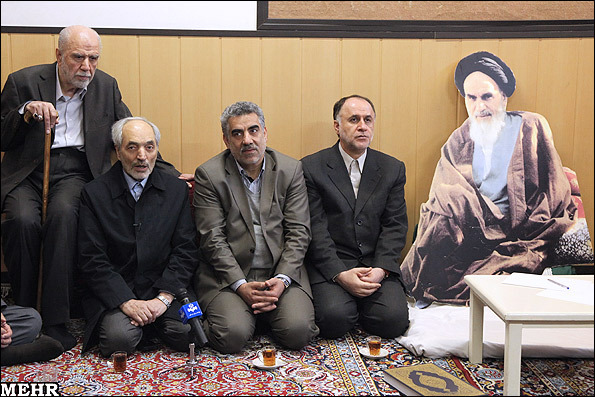 The Iranian Safavid government actually decided to celebrate the 33rd anniversary of “Ayatollah” Khomeini’s return to Iran from exile after the Islamic Revolution by having a cardboard cut-out replica of him traveling across the country. It even had a group of soldiers standing to attention and saluting him/it. 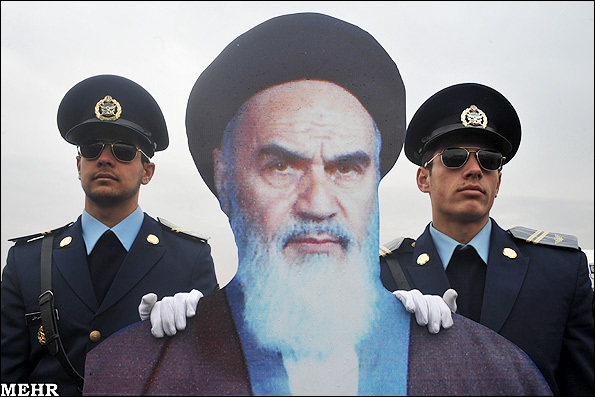 The Iranian government recently staged an anniversary celebration of Ayatollah Ruhollah Khomeini’s momentous return from exile in France. 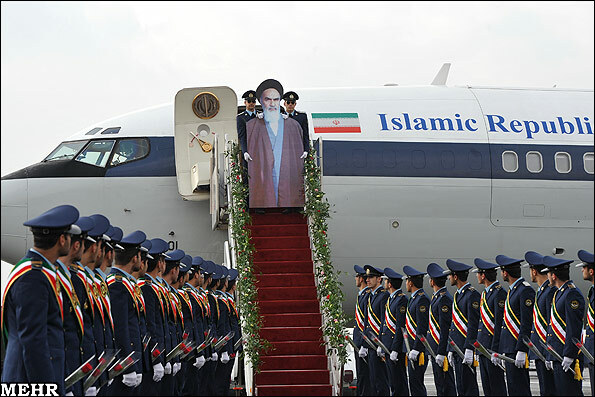 The cardboard reenactment of his arrival has been the subject of effusive internet mockery since photos from the state-affiliated Mehr News Agency (taken by photographer Ruhollah Yazdani) proved it was not, alas, an insurgent Photoshop hack operation but an official ceremony. 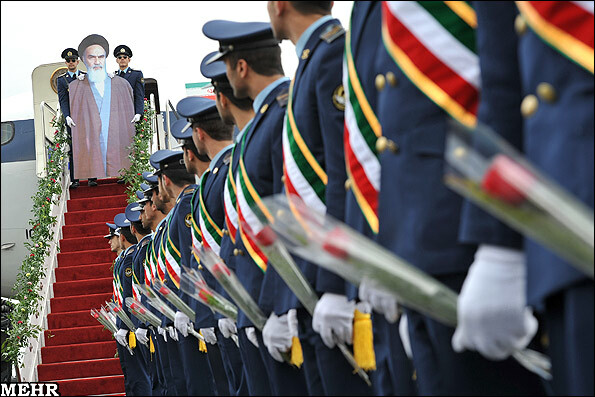 Once you regain yourself after laughing at the photos of the 2012 ceremony there’s something deeply serious and ironic to consider: as a consequence of the revolution Khomeini himself would turn into a figure of majesty, even divinity. He who denounced immodestly dressed women as ‘coquettes’ (the Shah referred to them as ‘dolls’) has been dwarfed into a string puppet. There’s a measure of pathos that elaborate stately images strike. These make a sad pauper out of the regime. Every time a historical event of seismic importance is glorified in Iran, it fails spectacularly. 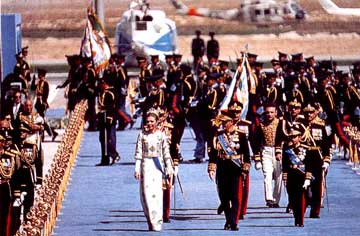 The Shah’s infamous Perspolis moment, when the royal family’s extraordinarily lavish, multi-million dollar ceremony marking 2,500 years of the Persian Empire outraged Iranians and turned them irrevocably against the monarchy. The Shah’s idolatrous visions were shattered by one of the most important revolutions of the twentieth century. The current show of idolatry is merely shattered by laughter, and the distant banging of US-Israel war drums (or unmanned drones, unprecedented sanctions, and scientist assassinations, as the case may be). I find myself more interested in what is really real in these photos than what constitutes simulacra of the real. 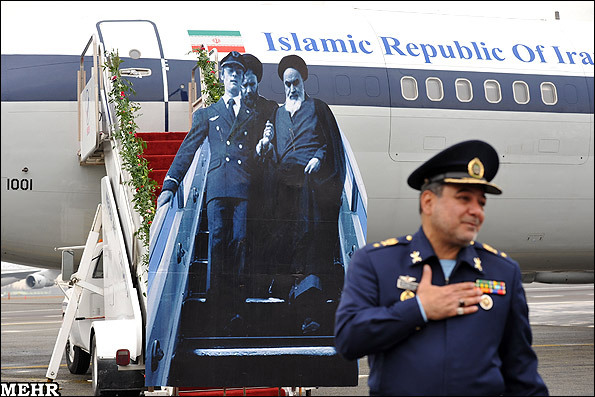 The Cardboard, escorted by guards solemnly holding each two-dimensional side of him, descends the official Islamic Republic of Iran airplane. The bristly green garlands of the plane, the sharp red edges of the staircase, and the curvacious aviator hats of the officers are all three-dimensional surfaces that put the spotlight even more harshly on the cardboard’s flatness. That flatness adds to the image’s hilarity, with a tinge of pity for the performed gullibility of those displaying it: don’t they see how idiotic this looks. 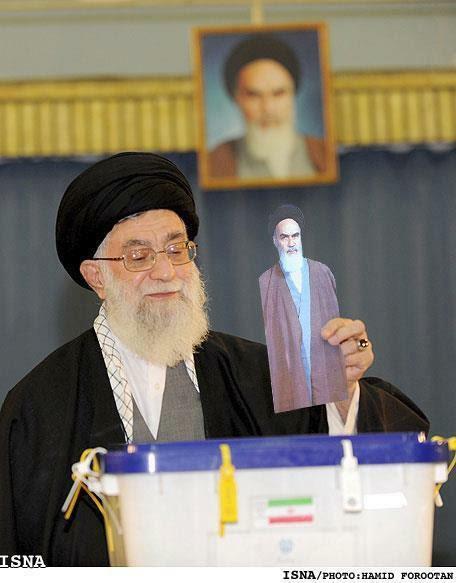 Cardboard Khomeini is descended to the tune of a musical procession of trumpets. (Khomeini did after all eventually legalize music). The officers salute the cutout. A lone guard looks back at the camera. Yo, is this for real real? The most remarkable photo is a peculiar sort of simulacrum, one that would have fogged up Walter Benjamin’s glasses: it is a cutout of Khomeini and his escorts, frozen in time, descending the staircase. 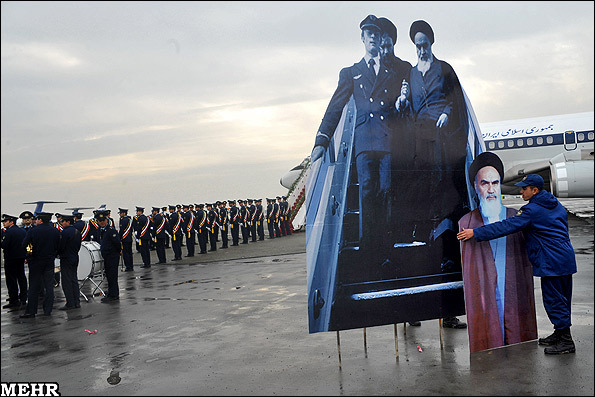 Jasmin Ramsey notes how the king-wears-no-clothes absurdity of the cardboard printout stands in contrast to the photographs of Khomeini’s picture being held up by thousands of adoring crowds at Tehran University in 1979. The contrast between that photo and the empty space of the tarmac in the 2012 images is stunning. A REMINDER: ملة الكفر واحــــــــدة – The nation of KUFR/DISBELIEF is ONE! 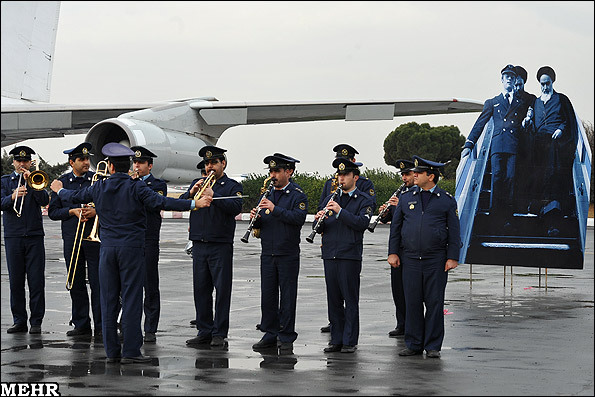 “Is this how [Iranian authorities] want to regain legitimacy? By creating a cardboard idol?” he asked. Another reality of the Pagan Republic of Iran – Idols of saints & “Ayatollahs”! 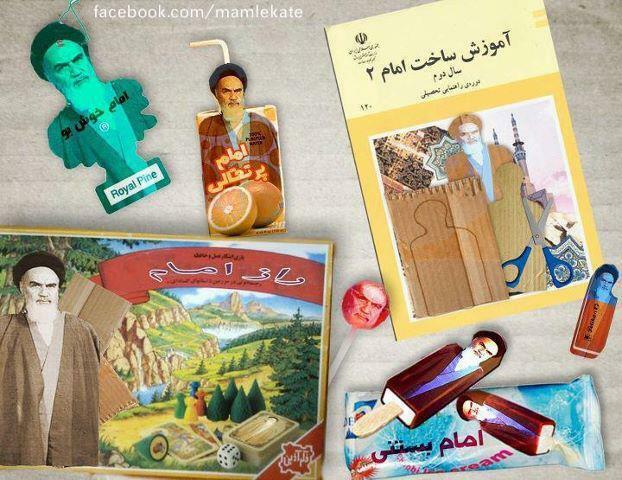 “The Cardboard Imam” also has a Facebook fan page where users have been posting jokes, parodies of old slogans about Khomeini, and pictures. 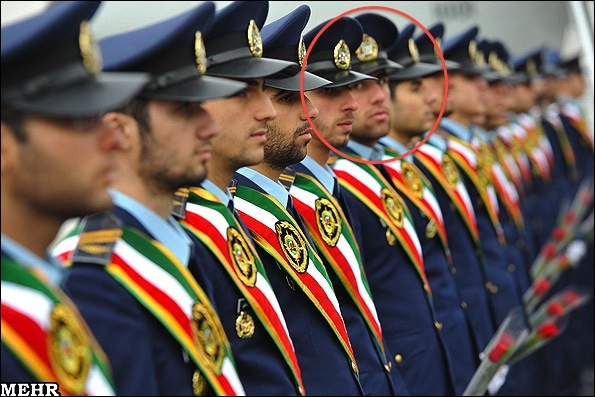 ← Another reality of the Pagan Republic of Iran – Idols of saints & “Ayatollahs”!